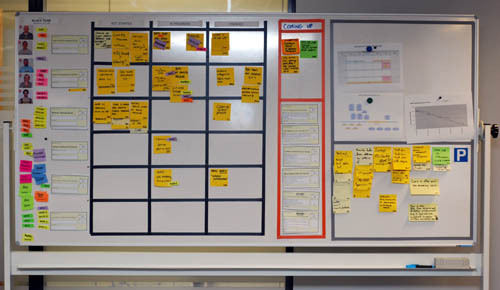 If you are looking for practical examples of visual controls for managing work in an office, go see the Visual Management Blog written by Xavier Quesada Allue, a software developer, Agile coach and project manager, it is full of photos and articles on what the software community calls “kanban” which is a bit different from kanban in the lean manufacturing world, but shares the “visual” element of “kan” and admirably, the “board” element of “ban”, too often missing in manufacturing. There is a great walk-through in the section Elements of Task Board Design, complete with photos of the items you will need to make your board and links to other articles by XQA on the elements of task board building. Photos such as this as well as tips on how to design, use and enhance teamwork and productivity among a creative workforce make this one of the best blogs I have seen in a long time. 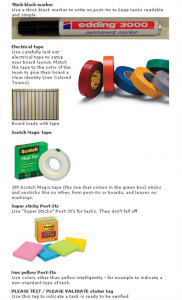 Nice photos, excellent tips and concise writing: have a look at the Visual Management Blog. As an agile and Lean Software Development practitioner, I find it so much rewarding to read lines and references about Lean in the software domain on gembapantarei ! 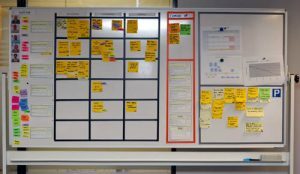 Taskboards are very common on agile projects since the year 2000 (mainly thanks to the Scrum methodology) but the recent Lean Software movement adds WIP controls and elements from the Theory of Constraints to it. We are also discovering the power of Kaizen, wastes removal and Genchi Genbutsu in our immature software industry !